For 50 years, the famous U-2 spy plane has been the premier reconnaissance platform for the United States. Able to fly above 60,000 feet, the U-2’s high vantage point allows it to see at great distances on either side of the aircraft. This ability to peer far inside the borders of nations with closed airspace has long made the U-2 a favorite of military commanders. The remarkable camera used in today’s U-2 is the Senior Year Electro-optic Reconnaissance System, or SYERS II. Operational from the 1990's, the SYERS has demonstrated an extraordinary ability to see long distances through the atmosphere, even when conventional visible spectrum cameras cannot. A combination of atmospheric attenuation and scatter can severely impact the shorter wavelengths in the visible part of the spectrum, so the SYERS II camera uses electronic sensors to see in both the mid-wave infrared (MWIR) band (thermal energy) and the short wave infrared (SWIR) band (reflected light). It is the SWIR band that gives the SYERS is remarkable atmospheric penetration capability in reflected light. 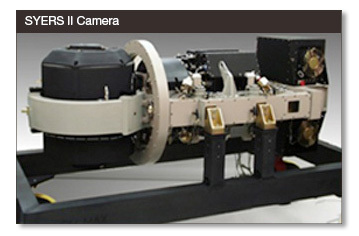 For military applications, SWIR cameras open the third and final window in the infrared spectrum. Long wave (LWIR) and MWIR sensors have long been a staple of military applications. Both are thermal sensors which do an excellent job of sensing human activity when that activity is warmer than its surroundings. Unlike LWIR and MWIR, SWIR sees in reflected light, so objects and persons look very similar to how they look in visible light, giving the military an all-new capability.